General and specialised learning of tasks. Evolving social behaviour (including emotions). 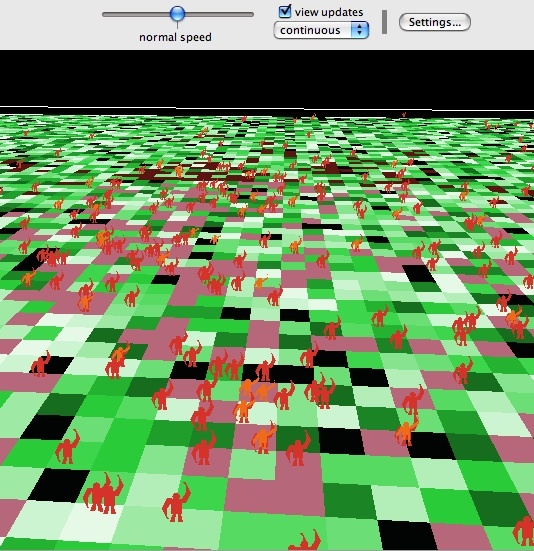 Software for simulations in the below research is available from the AmonI software page. Learning and intelligence in humans and other primates is interesting from both a scientific and an engineering perspective, because we primates learn more than other classes of animals. Our understanding of natural intelligence is enhanced when we build models of it, because we can test whether our theories really generate the behaviour we predict, and whether that matches what we see in nature. If we don't understand the biological origins of cognition, then we can't really understand what computation is for, how it benefits an individual or a population. Without understanding this, we can't say what AI should look like, nor what the appropriate role is of AI in society. We have more complete data about how they spend their time. Non-human primates don't seem to mind being observed every minute of the day (provided the observers are familiar and well-behaved) so we can get the kind of complete, quantitative statistical data on their social interactions that is impossible to get from humans. Non-human primates acquire significantly less behaviour culturally, partly because they don't have language. That means their behaviour changes more slowly, so it is easier to keep up with long enough to model. The work on this page ranges from basic primate cognition and task learning, through general social behaviour, and itno the specifics of human culture and its origins. My group takes a computational perspective on both cognition and culture: culture can be thought of as cognition / computation distributed across a population. This research program began during my 2001 PhD dissertation work on Systems AI. Since 2002 I have been working with colleagues in AmonI studying the interaction between individual learning and thinking, and the intelligence provided by either evolution (in nature) or a developer (in AI.) Note that in nature "provided" intelligence can come from genetics or memetics – it can come either via biology or from culture. AI too increasingly mines our biology and culture for intelligence, but it has the advantage of human programmers as well. The NSF Biological Information Technology & Systems (BITS) initiative provided a postdoc for Joanna Bryson with Marc Hauser at Harvard's Primate Cognitive Neuroscience Laboratory in their Department of Psychology. The EPSRC Adaptive and Interactive Behaviour of Animal and Computational Systems (AIBACS) programme has provided a PhD studentship for Hagen Lehmann with Joanna Bryson in modelling macaque social behaviour. The British Council's Alliance: Franco-British Partnership Programme supported travel for Hagen & Joanna between our lab and the Centre d'Ecologie et Physiologie Energétiques in partnership with Bernard Thierry. The Konrad Lorenz Institute for Evolution & Cognition Research partially funded a sabbatical for Joanna through their Hans Przibram fellowship, to study the biological evolution of cultural evolution. Further support was provided by the University of Bath sabbatical programme. The US Air Force Office of Scientific Research, Air Force Material Command, funded research in using social simulation to understand cultural variation in contemporary human anti-social economic behaviour. Q & A on this research. 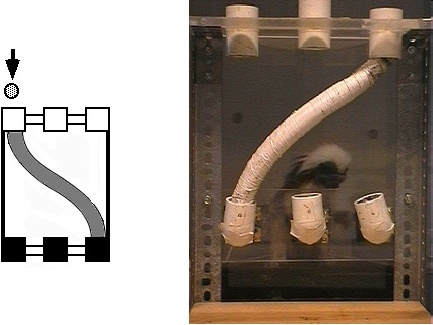 These are pictures of a monkey working in a test apparatus on transitive inference (TI), the first task learning we've modelled. Pictures and original data come from Brendan McGonigle, collected at his lab in Edinburgh in the 1970s. The subject is a Squirrel Monkey, Saimiri sciureus. TI is a much-researched task and serves well as a benchmark for theories of skill-learning. Originally it was thought only humans can do it, but now we know even rats and pigeons can, although they seem to do it differently from primates. Like most learning tasks, the best way to tell which theory is right is to look at how well they account for the mistakes the subjects make. This research led me to build a two-tier model of TI learning. A monkey working on a puzzle at the Primate Cognitive Neuroscience Laboratory at Harvard. This participant is a Cotton-Top Tamarin, Saguinus oedipus. The tamarin is trying to figure out Bruce Hood's tube task, another puzzle originally given to children. Despite the fact the food reliably goes down the tube, monkeys and small children keep expecting it will fall straight down. On the other hand, monkeys can learn this task if the apparatus is placed horizontally. This has led to the theory that their mistakes are a `gravity fallacy.' Papers about the monkey data are here, look for "gravity" in the title. Explaining this data has led to extending and generalising the two-tier model. Note: None of the animals in the above pictures live in their test apparatus! Monkeys only participate in behavioural tests like these if they enjoy it --- otherwise they refuse to work and there is nothing that can make them pay attention. This does occasionally happen, for example if there has been a big political disruption the previous day in the monkey colony (two monkeys fought or befriended each other) in which case they temporarily lose interest in anything else. 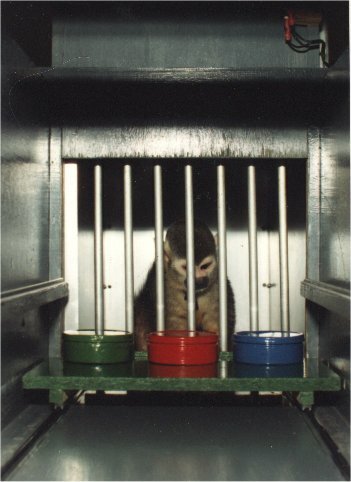 If you are worried about the ethics of primate research, you might want to read Why Primate Models Matter. 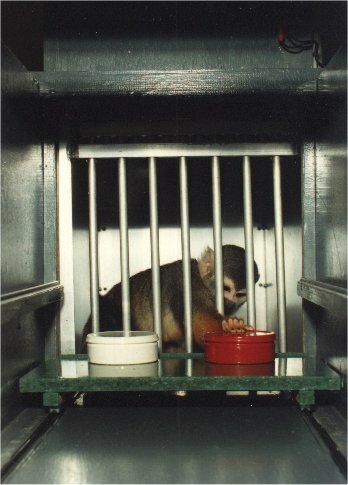 At least part of the reason the monkeys enjoy going to testing rooms is because they know it is a good place to get treats (peanuts for the squirrel monkeys, bits of Fruit Loops for the tamarins.) But many monkeys seem to think puzzles are intrinsically interesting and will play with them for a while at least even for no reward. Joanna J. Bryson and Marc D. Hauser, ``What Monkeys See and Don't Do: Agent Models of Safe Learning in Primates'', Proceedings of the AAAI Symposium on Safe Learning Agents, M. Barley and H. W. Guesgen, eds., AAAI Press March 2002. Mark Wood, Jonathan C. S. Leong and Joanna J. Bryson, ``ACT-R is almost a Model of Primate Task Learning: Experiments in Modelling Transitive Inference'', in Proceedings of the 26th Annual Meeting of the Cognitive Science Society (CogSci 2004), pp. 1470-1475. Joanna J. Bryson and Jonathan C. S. Leong ``Primate errors in transitive `inference': A two-tier learning model'' Animal Cognition, 10(1), 2007. Associated software. Joanna J. Bryson, Age-Related Inhibition and Learning Effects: Evidence from Transitive Performance, to appear at Cognitive Science 2009 in July. Same software as above. Modelling Natural Action Selection (Seth, Prescott & Bryson eds.) on Cambridge University Press, 2012. These are pictures (which I got from the Internet) of two different species of macaque monkeys in social interactions. Different species of macaques, despite being closely related, have different sorts of social structures. Some, such as the rhesus on the left, have very strict social structures and violent but infrequent fights. Others, such as the stumptails on the right, have more egalitarian social structures with frequent scuffles but few very violent incidents. The original goal of our research was to examine two conflicting theories of why this might be. Charlotte Hemelrijk believes it is because the more structured species evolved in more difficult climates with scarcer resources, leading to more violent conflicts. More violent conflicts in turn led to more structured societies. Frans de Waal believes that more egalitarian species have learned or evolved more social behaviours that help reduce the seriousness of conflict. Thus, violence is a consequence of species-wide behavioural ignorance. Carel van Schaik, among others, thinks that different social structures are responses to different environmental opportunities and threats --- this is called the socio-ecological theory. Others like Bernard Thierry think the differences are the result of chance events over their phylogenetic history. Charlotte Hemelrijk already has a well-published AI model she used to try to demonstrate her model could be plausible. However, we've replicated Hemelrijk's DomWorld model (click there for more details including our code), and found it was less applicable than she has said. Hagen Lehmann did most of this work for his PhD, and has also built a model of the socio-ecological model, which we are testing. Joanna J. Bryson, ``Where Should Complexity Go? Cooperation in Complex Agents with Minimal Communication'', Innovative Concepts for Agent-Based Systems, W. Truszkowski, C. Rouff and M. Hinchey, eds., pp. 298-313, Springer, 2003. Joanna J. Bryson and Jessica C. Flack, ``Action Selection for an Artificial-Life Model of Social Behavior in Non-Human Primates'', Proceedings of the International Workshop on Self-Organization and Evolution of Social Behaviour, C. Hemelrijk ed., pp. 42-45 , 2002. Emmanuel Tanguy, Philip Willis and Joanna J. Bryson, ``Emotions as Durative Dynamic State for Action Selection'', in The Twentieth International Joint Conference on Artificial Intelligence (IJCAI), Hyderabad, India, pp.1537-1542, January 2007. Associated software. Mark A. Wood and Joanna J. Bryson, ``Skill Acquisition through Program-Level Imitation in a Real-Time Domain'', IEEE Transactions on Systems, Man and Cybernetics Part B--Cybernetics, 37(2):272-285, April 2007. Joanna J. Bryson, Yasushi Ando and Hagen Lehmann ``Agent-based models as scientific methodology: A case study analysing primate social behaviour'', Philosophical Transactions of the Royal Society, B - Biology, 362(1485):1685-1698, September 2007. The case analysed in this paper concerns Hemelrijk's DomWorld, that link includes the associated software. Philipp Rohlfshagen and Joanna J. Bryson, Flexible Latching: A Biologically-Inspired Mechanism for Improving the Management of Homeostatic Goals in Cognitive Computation 2(3):230-241 2010. Associated software comes with the standard python/jython distribution of BOD. Gideon M. Gluckmann & Joanna J. Bryson, An Agent-Based Model of the Effects of a Primate Social Structure on the Speed of Natural Selection, in Evolutionary Computation and Multi-Agent Systems and Simulation (ECoMASS) at GECCO 2011 in Dublin. Paul Rauwolf & I, Expectations of Fairness and Trust Co-Evolve in Environments of Partial Information, in press since 2017 with Dynamic Games and Applications. This work has largely merged with my work below on culture and language, because it became clear that dominance was related to the social organisation underlying public goods creation, including language. See further my web page on cultural variation in human cooperative behaviour. Individuals of most social species (even guppies) keep track of how their group-mates have treated them in the past. Primates appear to also keep track of how their troop-mates treat each other. This takes much more memory, and possibly compositional reasoning. Scientists, philosophers, and of course many ordinary people have long wondered about what makes us special --- well, really what makes me special (where me is each of us), but from that, my planet, my country, my species. Although we probably share more of our intelligence and motivation with related species than we realise, there is no question that contemporary human lives are really quite different from the lives of other animals. We are the only ones with such elaborate and varied artifacts like buildings and laptop projectors, and we are the only ones who transmit behaviour via language. We are also different from other species in a large number of other ways. But the question is, which difference(s) came first? Science favours parsimonious answers, so we are looking for just one or a few simple differences between us and other species that might explain all the other differences. I became professionally involved in these questions through attending the Evolution of Language conferences. Originally I did this just because it was such an interesting and interdisciplinary group of scientists, not because I was interested in language origins. But I came to realise that understanding the social transmission of behaviour was fundamental to understanding intelligence. Consequently my hobby changed into the main topic of my two-year research sabbatical in 2007-2009. The altruistic communication of behaviour is easy to evolve. Species are cultural (that is, they communicate behaviour by means other than reproduction) broadly to the extent that they are cognitive. That is, if they learn and think at all, they are very likely to exploit the learning and thinking of their conspecifics. The reason many species have neither culture nor cognition is because learning is slow, unreliable and costly. The reason some species do have it is because individual plasticity can accelerate biological evolution, thus producing adaptive tradeoffs. Adaptive tradeoffs in turn produce species-level variation. In humans, cultural evolution happens faster so we use it more. This is because language allows both faster transmission of ideas and cognitive compression of concepts into simpler and more manipulable representations. The ability of perfect, temporally precise imitation. This probably evolved due to sexual selection for vocal imitation, as it has in other species. This gives us a representational substrate rich enough in information to provide robust, redundant cues to meaning, thus allowing an unsupervised learning process like evolution to operate. I'm sure this was essential. The ability to remember a lot of stuff. Apes have long lives and big heads, presumably in order to keep track of their social affiliations and their vast and creative set of feeding strategies. We and our ancestors may be the only vocal imitators with enough individual "work space" for cultural evolution to have generated such an efficient representation as language. Ivana Cace and Joanna J. Bryson, ``Agent Based Modelling of Communication Costs: Why Information Can Be Free. '', in Emergence and Evolution of Linguistic Communication C. Lyon, C. L Nehaniv and A. Cangelosi, eds., pp. 305-322, Springer 2007. Steven Butler and Joanna J. Bryson ``Effects of Mass Media and Opinion Exchange on Extremist Group Formation'', in The Proceedings of the Fourth Conference of the European Social Simulation Society (ESSA '07), Toulouse, France, pp. 455-465 2007. Associated software. Joanna J. Bryson ``Embodiment vs. Memetics'', Mind & Society, 7(1):77-94, June 2008. Avri Bilovich and Joanna J. Bryson, Detecting the Evolution of Semantics and Individual Beliefs Through Statistical Analysis of Language Use, Proceedings of the Fall AAAI Symposium on Naturally-Inspired Artificial Intelligence, Washington DC, November 2008. Associated software. Joanna J. Bryson ``Representations Underlying Social Learning and Cultural Evolution'', Interaction Studies, 10(1):77-100, March 2009. Joanna J. Bryson, ``Cultural Ratcheting Results Primarily from Semantic Compression''. The Proceedings of Evolution of Language 2010, Smith, Schouwstra, de Boer & Smith (eds.) pp. 50-57. Harvey Whitehouse, Ken Kahn, Michael E. Hochberg, and Joanna J. Bryson, The role for simulations in theory construction for the social sciences: Case studies concerning Divergent Modes of Religiosity, Religion, Brain & Behaviour, 2(3):182-224 (including commentaries and response.) Associated software is in the electronic appendix and on the AmonI software page. Bath hosts open access versions of the target article and the response, for the full PDF (including commentaries) email me. Simon T. Powers, Daniel J. Taylor and Joanna J. Bryson, Punishment can promote defection in group-structured populations, in The Journal of Theoretical Biology, 311:107-116. Archived preprint. More on Costly Punishment. Joanna J. Bryson, The Role of Stability in Cultural Evolution: Innovation and Conformity in Implicit Knowledge Discovery, book chapter in Perspectives on Culture and Agent-Based Simulations, Virginia and Frank Dignum, (eds), Springer, Berlin 2013. Associated software. Joanna J. Bryson, James Mitchell, Simon T. Powers, and Karolina Sylwester, Understanding and Addressing Cultural Variation in Costly Antisocial Punishment. To appear in Applied Evolutionary Anthropology, Gibson & Lawson (eds. ), Springer. Revised version from May 2013. More on Costly Punishment. Eugene Y. Bann and Joanna J. Bryson, Measuring Cultural Relativity of Emotional Valence and Arousal using Semantic Clustering and Twitter, Proceedings of Cognitive Science 2013, pp. 1809-1815. Paul Rauwolf, Dominic Mitchell, and Joanna J. Bryson, Value homophily benefits cooperation but motivates employing incorrect social information, Journal of Theoretical Biology 367:246–261. Dominic Mitchell, Joanna J. Bryson, Paul Rauwolf, and Gordon Ingram, On the reliability of unreliable information: Gossip as cultural memory, in Interaction Studies, vol. 17:1 pp. 1–25. Aylin Caliskan, Joanna J. Bryson, & Arvind Narayanan, Semantics derived automatically from language corpora contain human biases. Science 356 (6334):183-186 [14 Apr 2017]. Be sure to also look at the supplement, which gives the stimuli and shows similar results for a different corpus and word-embedding model. Meaning really is no more or less than how a word is used, so AI absorbs true meaning, including prejudice. We demonstrate this empirically. Open access version: authors' final copy of both the main article and the supplement. Software for simulations in the above articles is available from the AmonI software page.